An card game of epic dungeon exploration. Though saddled with an overly long and clunky name, shoe-horned into a licenced theme, and Frankensteined together from mechanics borrowed from other FGG games, WQ:TACG (sigh) is still a fun dungeoncrawling card game that’s also enjoyable when played solo. Players are already crying out for more cards and more scenarios, and I think we can all safely assume FFG with happily drop more tidbits into our craning mouths like a mother bird feeding her starving chicks. 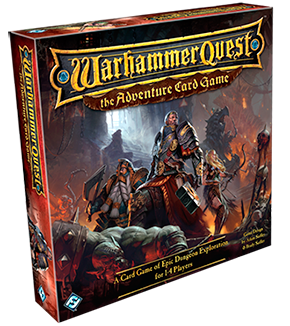 Choose an action for your character (hello Space Hulk Death Angel: The Card Game! ), roll some dice, explore, rest, aid or attack, move on to a new location (hi there The Lord of The Rings: The Card Game!) … am I sounding a little jaded? Well, maybe. It’s a good game, I just don’t know if it will be lovingly taken down from the shelf for years to come with that thrill of anticipation that characterises a wonderful game. But more positively, there is a real sense of party cooperation, the artwork is excellent, and the decisions are meaningful. The game sets out to provide and dungeoncrawling experience in a card game and within that narrow framework, it does it well.